If the plants are tall or too close spacing, can we use Laser Spray? Yes. Use raised bund of 30 cm height and 30 cm width for use on taller crops. 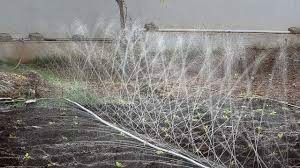 In case of very closely spaced crops, leave 15 cm wide space on two sides of the Laser Spray pipe so that the possibility of water jets getting blocked by the plants is by and large eliminated. Does Laser Spray water jets cause any harm to the fruits and flowers of the plants? Laser Spray has very fine water droplets coming out with low pressure. Hence, there is hardly any possibility of damage to fruits and flowers. Will water falling on the plants can cause disease? Laser spray operation time is very short ( just 10-15 minutes) as it irrigates very fast, and so, it does not create a moist environment which can cause the incidence of disease. Instead, it helps wash away insects from the crop. How many valves can be operated at a time? It depends on the pump’s discharge and size of the submain and mainline. As you know, the discharge of Laser Spray is 175 per meter. Running length of Laser Spray of 32 mm is 50 mtr and so, the total water discharge is 50 x 175 = 8.7 m3/hr. What is the solution if the system gets clogged? 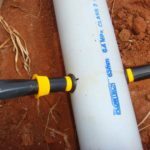 Typical clogging of drip irrigation systems is of two types: 1. Due to saline water 2. Due to foreign particles. severe clogging, you can use a light acid treatment, which costs around 500-700 Rs. / acre. Clogging due to foreign particles is rare if the system is installed with a filter. We recommend opening the ends of the laterals and flushing the laterals once a month and flushing the filter once per season. To prevent clogging, ensure that the ball valve connected to the mainline is closed prior to turning off the pump, else a suction will be created pulling dirt particles into the emitters. What can we do to prevent the laterals from flying around in the wind? One option is to tie the end of the lateral to a stick or wooden stake at the end of each row. You can also use cycle spokes, thick wire, or any other similar kind of material, cut it into small pieces, bend it into a “U” shape, and press it into the ground at 2 – 3 locations along the length of each lateral. What happen if we put laterals in hot summer sun? 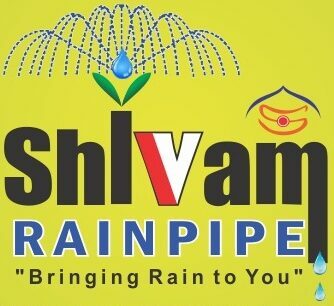 Shivam Drip laterals uses special grade virgin poly ethylene mixture and a UV stabilizer, giving a life expectancy of at least 5 years for 400 micron and at least 3 year for 200 micron laterals. If there is a slope in field, does this system work? The system is designed to work with low water pressure, and so it works best on flat ground. Permissible slope is 1 to 2 degrees. In this case, we recommend laying the sub main along the slope and laying the drip laterals across the slope, for maximum uniformity. For uneven field, the takeoffs at low points or near the water source can be only partially open while the takeoffs at high point on the field or farther from the source can be fully open. Once uniform discharge has been observed with the drip laterals facing punches up with the jet height is 12 to 18 inches, the drip laterals can each be flipped over to face down for more precise water application to the root zone. But one must ensure that the ball valve connected to the mainline is closed prior to turning off the pump in this case to prevent clogging, else a suction will be created pulling dirt particles into the emitters. Do I need to install a filter? Yes, it is recommended that you should install a filter. Do not install the system without a filter. FØor reference, a screen filter of minimum 30m3/hr capacity and screen of minimum 120 mesh/125 micron is recommended. What is the suitable pump HP to run the system? Our system works with 1 hp to 10 hp pumps. Our system is optimized for low pressure so you can run the system even with 1 hp pump, but with 2-3 sections in 1 acre depending upon the pressure you get. With a pump of 7.5 hp or 10 hp, a bypass valve may be required depending on the distance of the pump from the field and the condition of the pump. Adjust the pressure till the jet height is 12 to 18 inches with help of takeoff valves. What is maximum permissible length for 16mm tape? and 200 meters (656 ft.) respectively. What happens if the maximum permissible length of laterals is exceeded? Non-uniform water discharge from the punched holes leads to uneven water distribution and wastage of water. Large variation in pressure across tape increases the chances of water clogging.